Our first day in Brussels and in all honesty, our timings have been all over the place. So a full warning that there is only one meal shared in this post but a very good one to be fair. To give you a little background story if you haven’t already read the travel post, we arrived in Brussels around 3.20 ish in the afternoon, by this point we haven’t had breakfast (bad I know) and no lunch. So upon apron arrival, we literally found the closest place to eat, had a quick baguette sandwich and off we went to our hostel. So as you can see, nothing that would have interested you there. For dinner we obviously couldn’t resist finding the number one Belgian Fries place, could we? We found Fritland right in the centre, with seating area inside and outside nearly full, and a long line to the road, we knew we were at the right place. We found a place to sit inside and order a portion each paired with our choice of sauce. 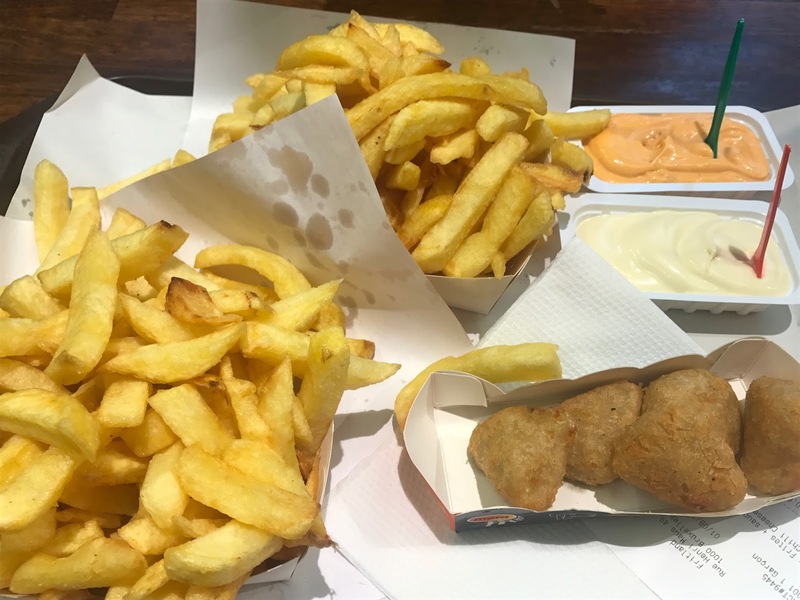 James got the classic mayo, while I went for the Samurai sauce, as I loved it in Amsterdam! The portions were big, enough to fill a person for dinner to be fair and for really good price as well! Along with our large portion of fries, James surprised me with some chilli cheese nuggets! Yum yum yum, to be fair it tasted like the ones from Burger King but that’s not meaning it’s a bad thing. We originally wanted to get waffles after as we didn’t think we’d be full from simply fries, but we were, so we decided to walk to build up and appetite again but by then, the waffle place closed, so a visit tomorrow is a must! They look amazing. I think I know what I'm getting for my tea tonight, haha!